With all the attention on crowds of ordinary people rising up and asserting themselves against corruption and self-dealing by an oligarchy, we’re missing what the oligarchs are doing right at home. 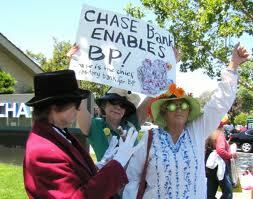 Take, for example, the activities of one of our biggest banks, JPMorgan Chase. Despite those suspicions and many more, the bank allowed Mr. Madoff to move billions of dollars of investors’ cash in and out of his Chase bank accounts right until the day of his arrest in December 2008 — although by then, the bank had withdrawn all but $35 million of the $276 million it had invested in Madoff-linked hedge funds, according to the litigation….. This is not the only recent example of practices that are, to put it kindly, ethically dubious. In another blog post, I recount how the American operations of Deutsche Bank improperly foreclosed on an American soldier while he was away serving his country. And in yet another, I noted how JPMorgan Chase (them again) were overcharging thousands of military families for their mortgages—and had improperly foreclosed on more than a dozen such families. So there we have President Obama expressing guarded support for the Egyptian people in their uprising against those corrupt, entrenched interests, while at home, he’s unable to do terribly much about interests like Morgan. For one thing, they’ve got the government pretty well sewn up. Not bad to have an executive from your bank (Bill Daley) recently appointed as the president’s Chief of Staff, and to have your bank’s CEO (Jamie Dimon) on particularly friendly terms with the Treasury Secretary. It’s not just Chase. Above, I mentioned Deutsche Bank. Yet another bank mentioned as having known about and done nothing about Madoff is UBS. That bank is so close with Obama it goes on vacation with him. See this exclusive investigation we did at whowhatwhy.org. If we’re going to stop being hypocrites, we have to apply the same standards to rotten institutions wherever they are. That doesn’t mean we have to necessarily stop dealing with Morgan, which is pretty ubiquitous, but we do have to demand better scrutiny of their underlying practices, and much more aggressive action to limit their potential for harm. That’s one reason real change is so difficult. Everything is woven into everything else. Mubarak could have learned a lesson in this. Get everyone to have some stake in the problem institutions, and watch your worries melt away.